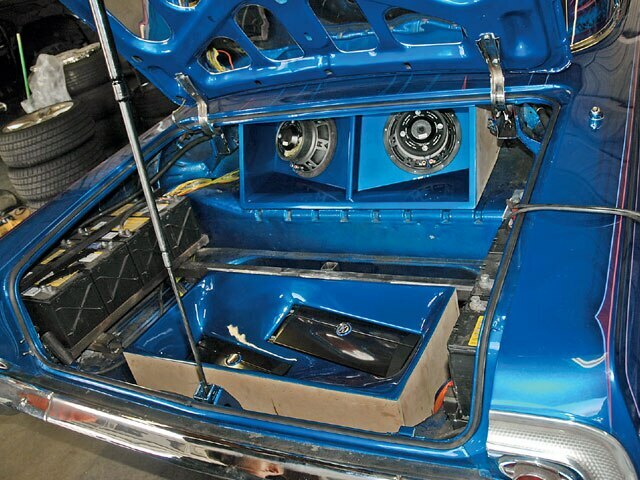 A Bangin' System Can Breathe New Life Into A Crowded Trunk. 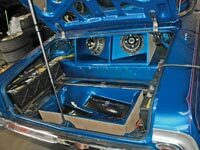 In the July ’07 tech article, “Size Matters,” we started on a facelift of the trunk in Marty Felix’s ’64 Chevy Impala, “Life After Death.” In that article, we focused on the downsizing of the hydro setup and alluded to a big sound system to come. So here we are with the finish line in our sights and ideas running though our skulls. As always, we look upon the empty pallet that our trunk provides and scope out the best opportunities to showcase everything possible. 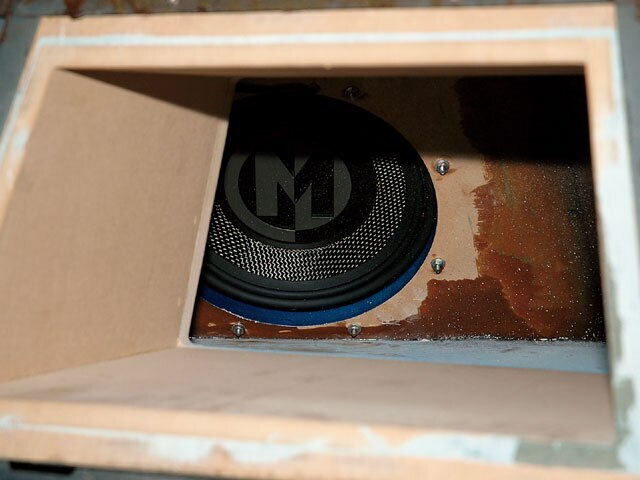 Unlike the previous installation, we hope to achieve more sound quality and much more flash than before. So what do we do? 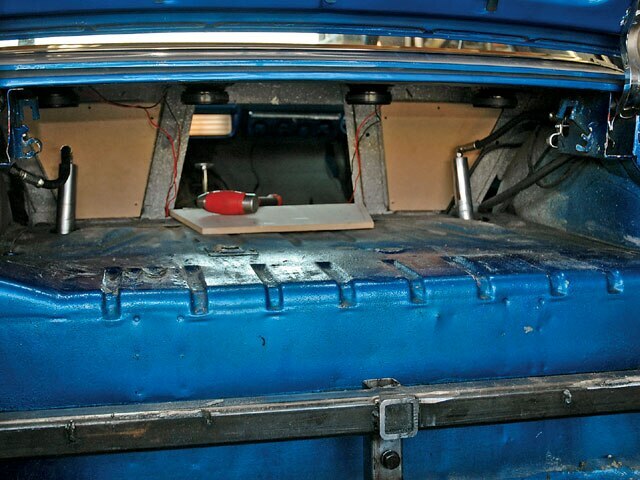 Follow along and watch this trunk be reborn. Straight from Custom Lows in Riverside, California, to Radioactive in Ontario, California, the ’64’s ready for the next progression. We begin our endeavor by gutting the trunk. Now that we’re clean, the first order of business is to cut out the rear bar of the hydro racks that’s no longer being used to allow for the amplifier rack. After measurements were properly taken, the box building begins. 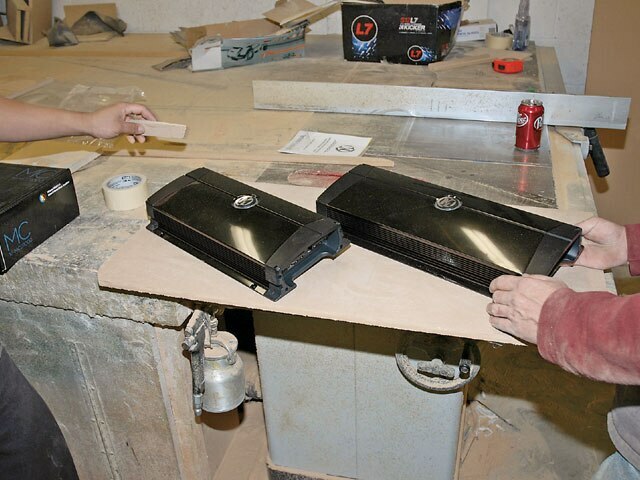 For a more dramatic effect, the speaker mounting boards were cut with compound angles. 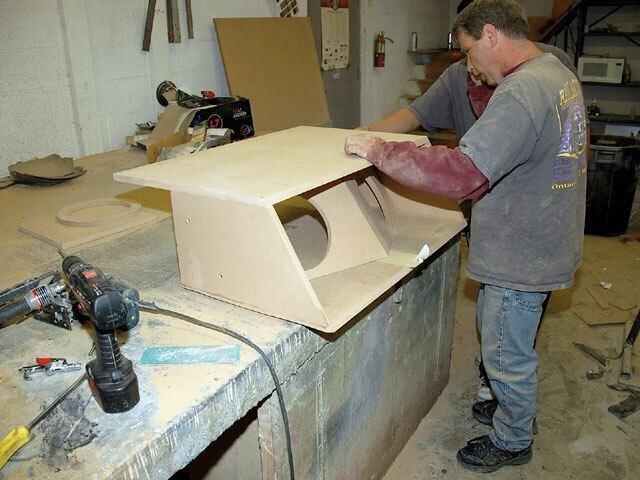 The second board was cut out and a router was used to cleanly cut the second speaker hole. 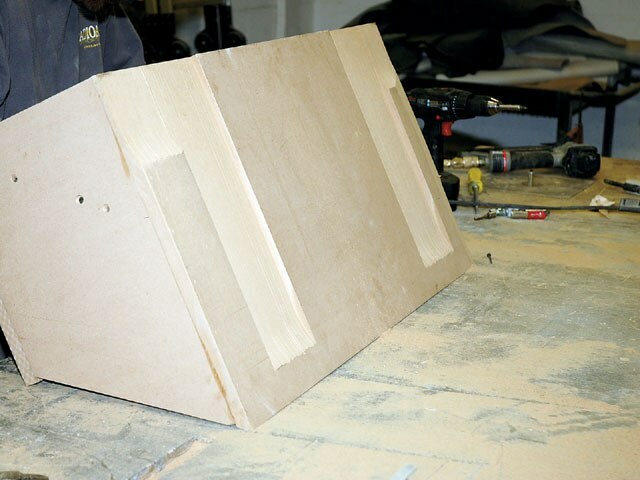 The top panel of the box was then cut out. 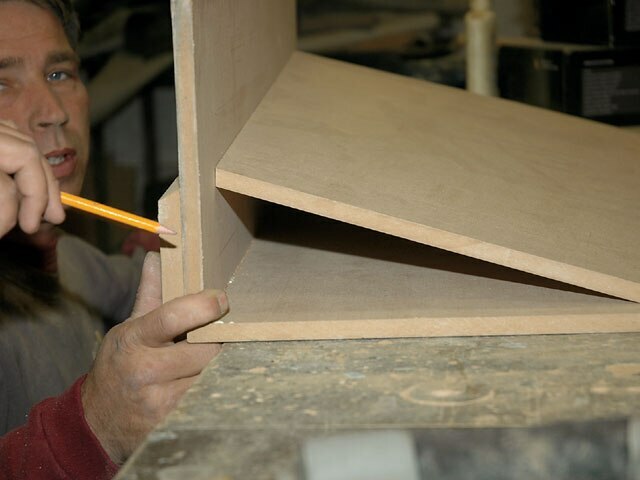 The angle was first cut and matched before trimming the rest of the panel down to size. A temporary panel was nailed in place to allow more working room and to hold the compound panels in place while they’re being secured and finished. 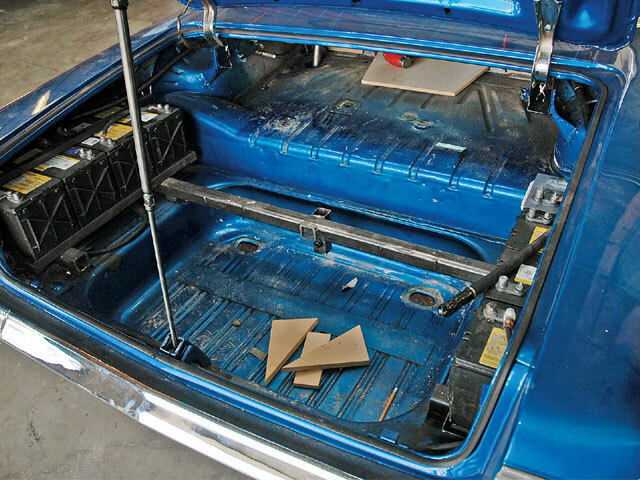 Notice that the bottom of the box had grooves cut out to allow room for the factory contours of the trunk/package tray floor. 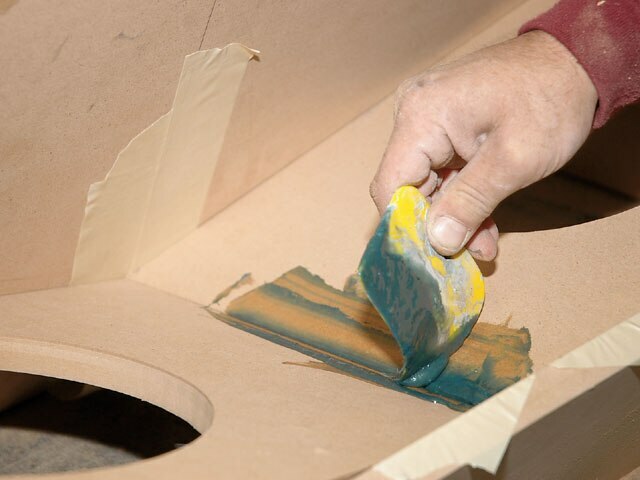 To fill the groove and keep it solid, a mixture of kitty hair and resin was used on the backside of the speaker panel joint. 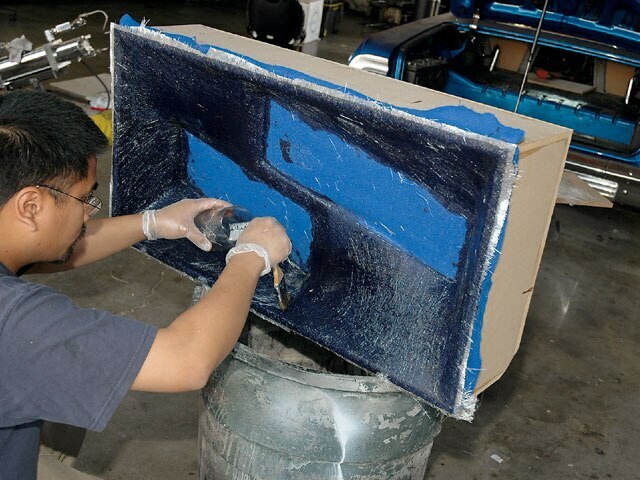 After the mixture flash dried, fiberglass matt was resined into place to ensure our panel would not separate. 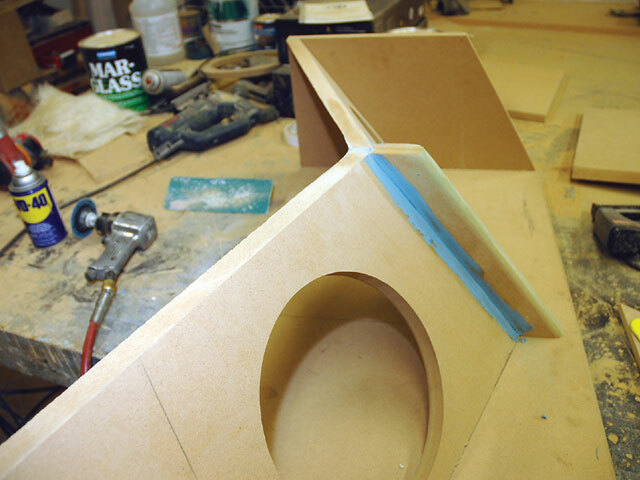 An additional support piece was also created and molded to the face of the joint. Focus was then shifted to the amplifier rack. 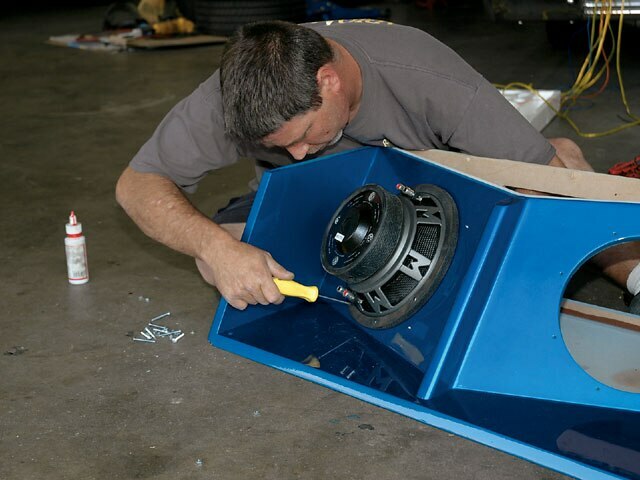 The amplifiers were measured up and a clean angle was found that would allow the amplifiers to drop right into our trunk well area. For better viewing, the amp board will be angle-mounted. Here, a support panel was measured. 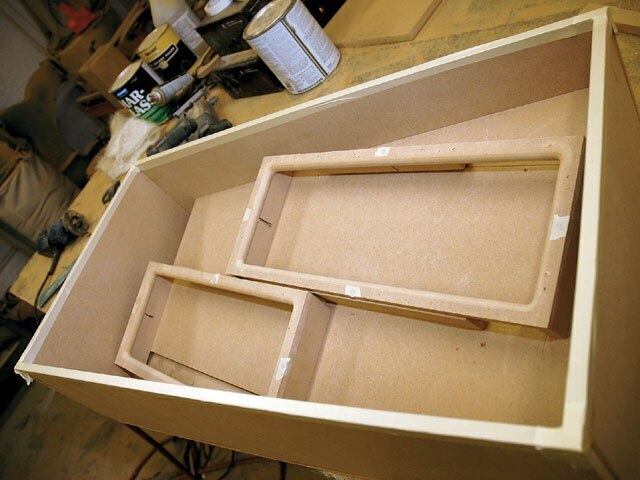 The final contours of the beauty panel are still not known, but one thing’s for sure, the trim panels for the amplifiers must be square to look right. 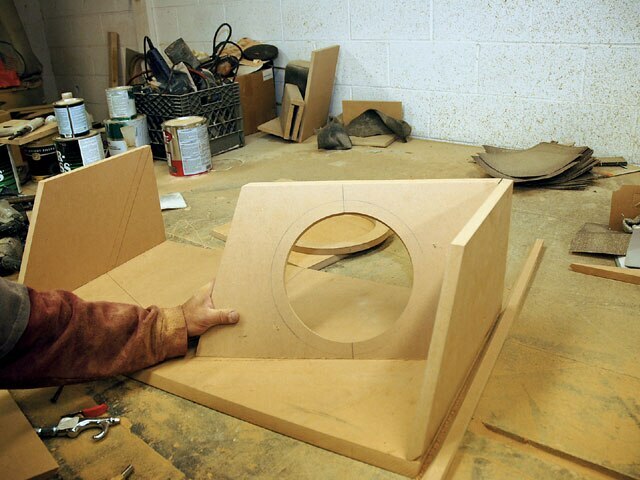 For the final details of the amp rack, the mock-up was taken to the well area and measured up. 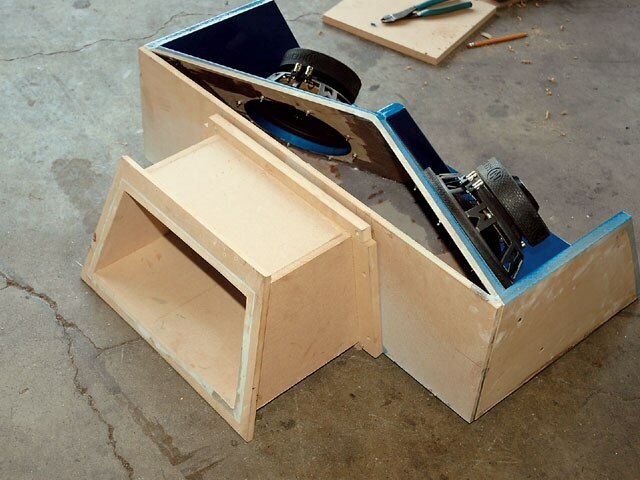 Steps were then created to support the amp trim rings. 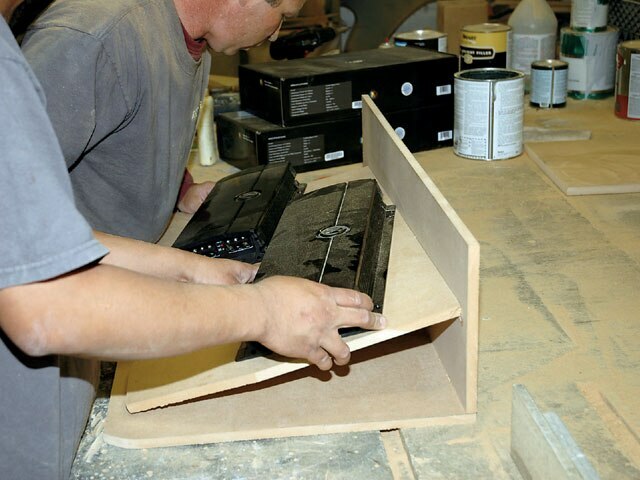 The steps were then trimmed to allow for the wires to pass through and then predrilled, screwed and routed. 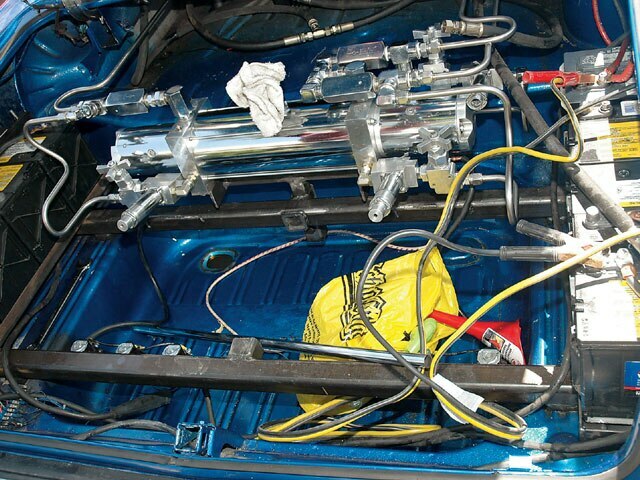 The rack is now ready to be stretched and resined. Notice that the screw holes were covered. 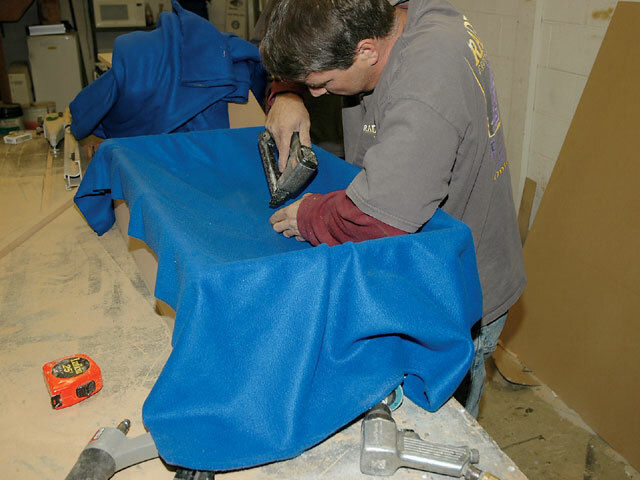 With our stapler in hand, we begin the process of stretching fleece over the area. All stretched and ready for resin. 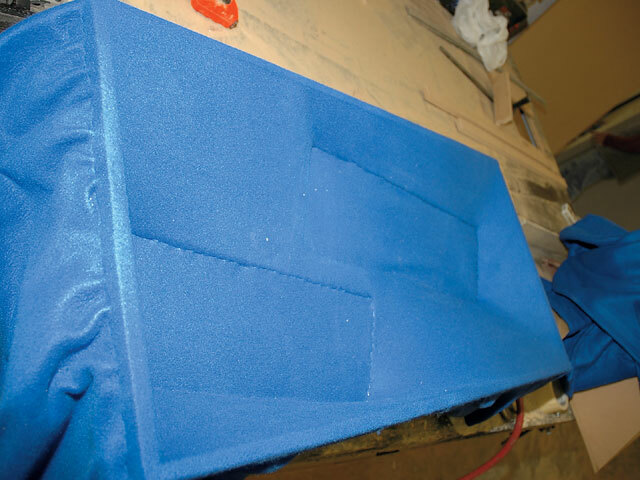 The entire surface was soaked with resin and fiberglass mat was applied for additional strength. After the resin was pretty well dry, a second coat was applied. From there, the pieces are off to the body shop. 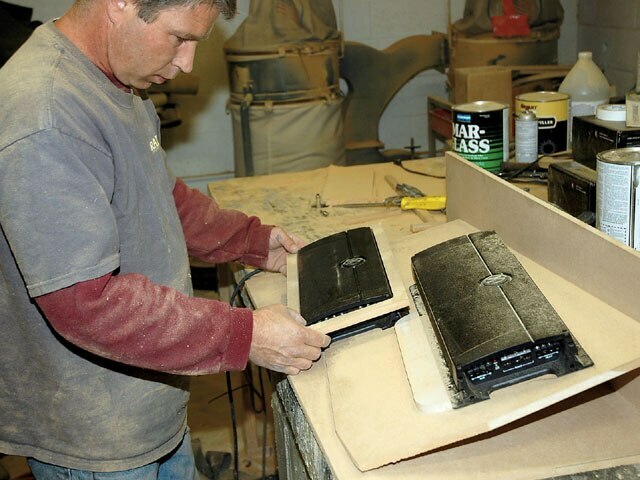 Holes were drilled to allow the amplifier wires to pass. 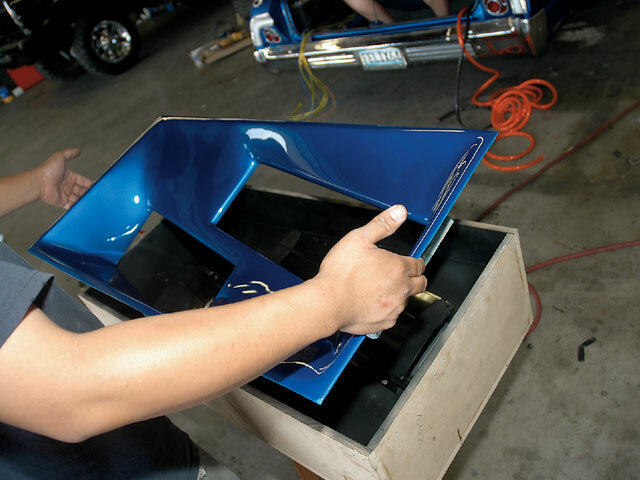 The panel is now back from the body shop. First, it was test fit to ensure that everything remained aligned. The box is also back from the body shop. 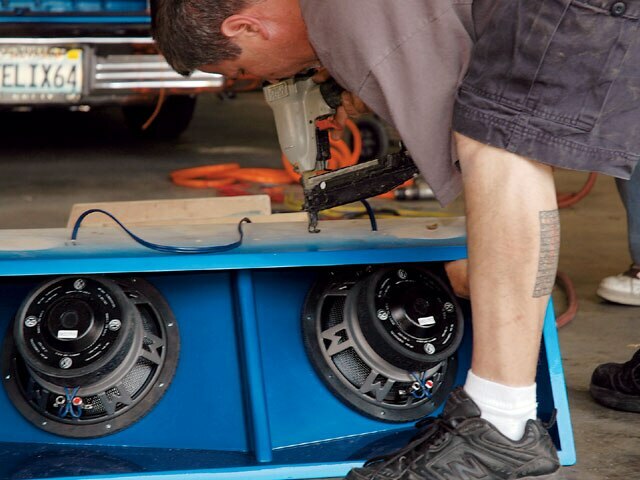 Here, the speakers are secured using nuts and bolts. Thread lock is used to ensure these guys don’t vibrate themselves loose. 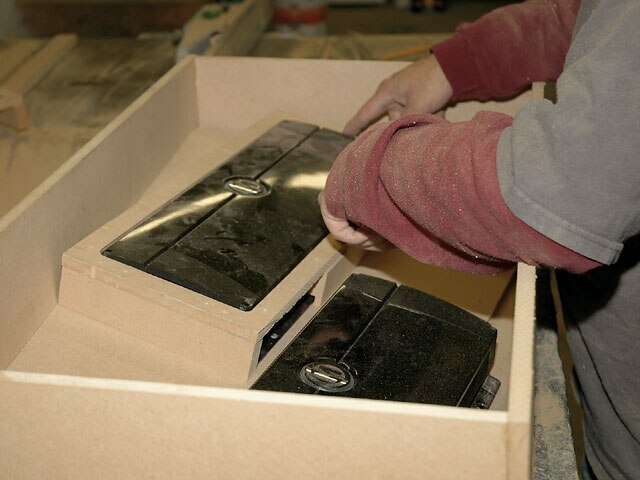 The speakers and forced air port are secured and the box can be sealed up. 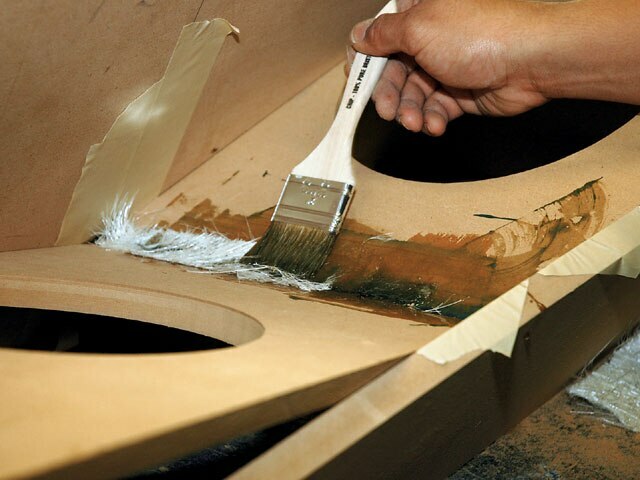 A consistent bead of silicone is applied before the top is put on. 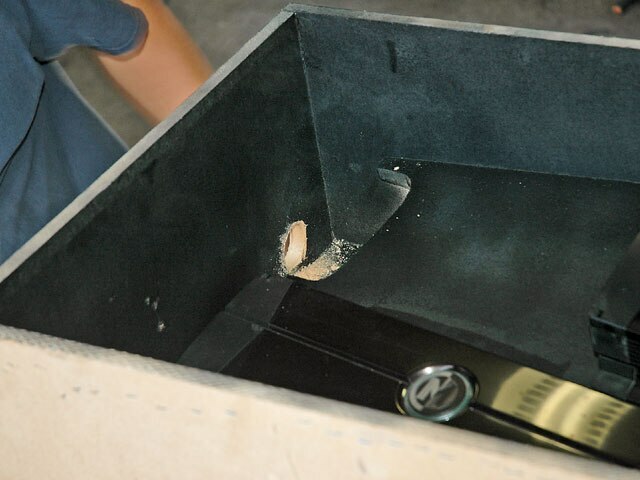 After the predrilled screws were tightened, the box top was air-nailed in place. All wired and assembled, the box was slid into place. 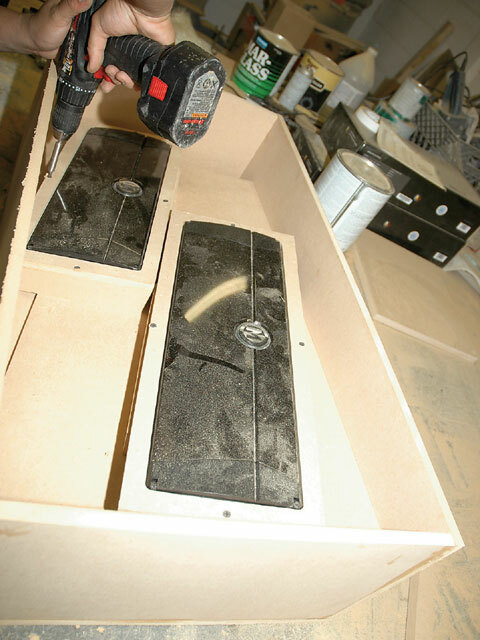 Screws were predrilled from the box to the floor panel. These screws were tightened down before the Plexiglas panel was attached. 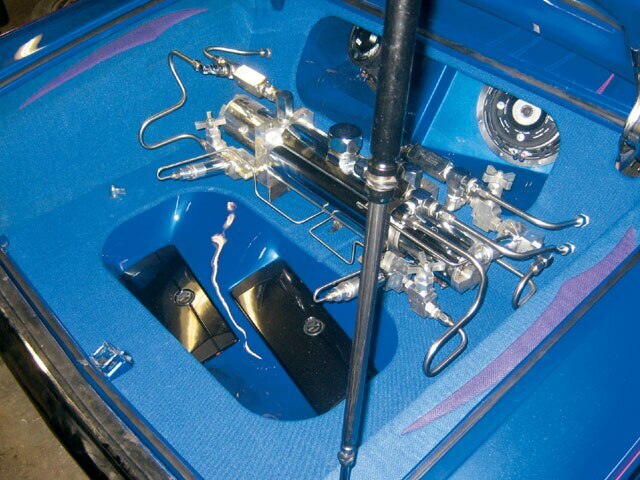 Here’s a look down the “throat” of the beast. The enclosure’s forced air port was also screwed in place for added security. The system is now in. 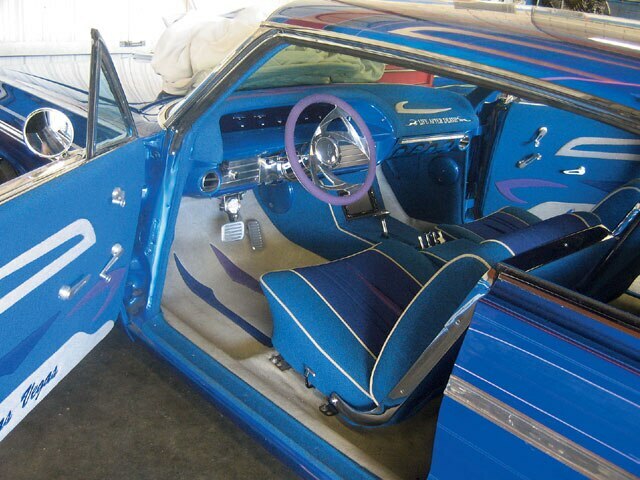 Tuned, tweaked and ready for upholstery trimming. 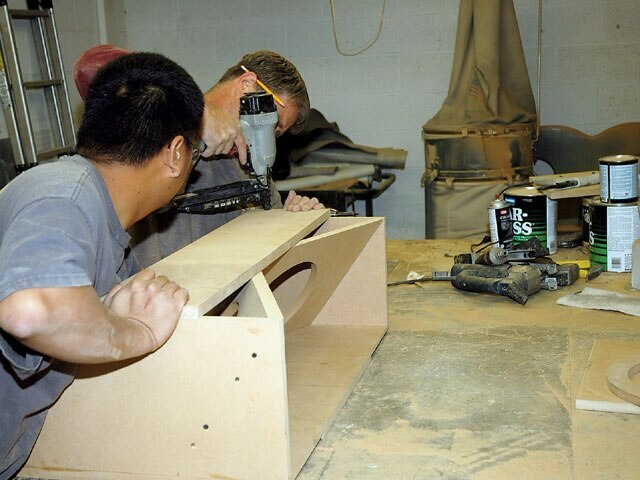 Jesse from Custom Lows made a guest appearance to mount the bulkheads to the upholstered panels and bend the final lines for the setup. So our interior has a new array of color-matched Memphis Audio speakers and a custom-mounted double-din Kenwood head unit.